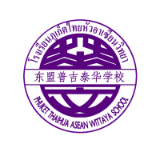 Phuket ThaiHua Asean Wittaya school is a tri-lingual private school, educating students from Pre-K to K12. Our purpose is to develop students towards an international future. The school is located in Phuket Town.